A participant MUST have headphone acceptance and cooperation in all sessions to successfully complete Berard AIT. If you are concerned that your child may not tolerate headphones well, please practice for 1 - 2 weeks prior to beginning your Berard AIT sessions. 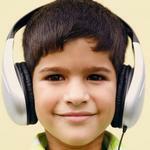 Sometimes children are defensive to a headset but not to being touched on the head or ears. Prior to working on this headphones acceptance procedure, make sure your child is not (or is no longer) defensive to being touched any place on the head or around the ears. Give your young child daily head massages. Rub around his/her ears to help prepare your younger child for Berard AIT Sessions. Massaging your child's head and rubbing their ears will also prepare them better for wearing the headset during the 20 Berard AIT sessions. Practicing with these things daily should help considerably with acceptance. You don't want your child to love using headphones so much that he or she will be wanting music with headphones afterward! You may need to begin by playing some of his/her favorite music over speakers, then start wearing a headset yourself and announce that Barney, Clifford (or whoever the favorite character happens to be) is speaking or singing to you through this little speaker (pointing to the headset). Try for just a moment to place the headset around the child's neck and shoulder's or next to the child's ear, if you anticipate resistance. If he/she shows acceptance and appears interested in listening, go straight for the ears. Keep the headset on for just a few seconds to start, then take it off. Ask the child if he/she wants to hear "Barney" sing more to him/her. 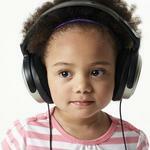 Then, as your child tolerates begin to expose him/her to a wide variety of music with headphones, starting now. This should include some children's songs, classical, vocals, bluegrass, country, new age, etc. but not drums, heavy metal, hip-hop or music with unusual beats or a heavy base sound or music that is syncopated or polyrhythmic. Be sure to keep the volume relatively low and have him/her listen just 1 to 3 minutes, a few times per week, to get him/her acclimated to using a headset. This should be enough to keep him/her in practice for the headset usage required for Auditory Integration Training. 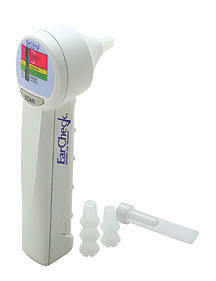 Parents may want to consider purchasing the EarCheck, Middle Ear Monitor (www.earcheck.com) device. This is a parent-friendly and reliable way to check for signs of ear fluid for children ages 6 months to young adult. The tip of the device is inserted into the external canal just like an ear thermometer. The device then checks the fluid level in the ear. Detailed information about this device is available at www.earcheck.com. Use every precaution to keep your child well, by not taking him/her to closed in experiences with crowds of people or sick others, avoiding parties, school, shopping, etc. would be good during Berard AIT and the week before Berard AIT! It may be very helpful to use photos and do social stories around the Berard AIT listening sessions for young children who need this. Slide Show About AIT: To help a younger child understand more about AIT, you may wish to review the on-line Slide Show About AIT with them. 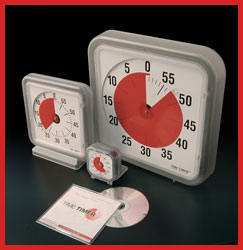 Time Timer: Some parents might purchase of a Time Timer at to help their child understand the passage of time. A Time Timer is often used by Occupational Therapists for those children who have difficulty with transitioning. By using this simple visual timing device, children have an idea when an session will complete, if they don't understand the passage of time, regardless of age. 5. What Happens With My Child During Berard AIT Sessions? The child will be sitting on a comfortable chair, bean bag chair or other comfortable surface during all Berard AIT sessions. The music is quite varied, but mainly popular music that you may hear on the radio, which has been modulated through the Berard AIT equipment. Other things may be tried as well, but we really want the child to be LISTENING and responding to the music and not another distraction. Some children want to sway their bodies or get up and dance - and that is allowed if needed for a short time. The headphone cord is only 4 feet so this is restricted to some degree. Children do not usually find this an unpleasant experience, except those with a compulsion to move. Even those kids can quiet down as the music works on the vestibular system (the movement system) which can quell their need to seek this elsewhere. The parent is normally asked to make careful observations of a child between each session and note observations on any forms provided. The observations will include any behaviors which are not typical (negative or positive) or are more or less than expected behaviors.